Chicago is a world-class city because it offers premier entertainment, great local sports teams, and delicious food. The city of Chicago has long prided itself on its culinary scene. You can walk up one block in order to take in a dinner fancy enough to make Alton Brown blush. Or you can be like us, and search out the greatest easy-eating food in the city. Today, we are looking at the Polish sausage. The Polish sausage was brought to Chicago by immigrants and it has been perfected over the years at the following five restaurants in Chicago! Loosen that belt and prepare to dig in! We are going to start our Polish sausage dining tour by traveling down to the Ukrainian Village in order to grab a bite at Fatso's Last Stand. Appropriately named, Fatso's Last Stand has been a local favorite for years as their unique take on comfort-food and Chicago traditionalism keeps the lines coming. Here, we suggest grabbing yourself the Maxwell Street Style Polish Sausage for a quick, greasy, and filling meal. With Fatso's behind us, we're going to grab an Uber and head across town to the legendary Portillo’s. 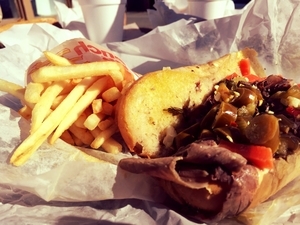 Located at 100 W Ontario Street, Portillo's has been a local favorite since their doors first opened back in 1963. In this cafeteria-style restaurant, you can fill up your tray with enough food to feed the Chicago Bears offensive line. We are, of course, beholden to their Polish sausage and we suggest washing it down with a tall glass of lemonade. The sausage here is crispy and tastes delicious on a juice-soaked bun, so don't forget to ask for it when your order. As our Polish sausage food tour ends we'll be rolling up to the curb at Jim's Original. This restaurant was established over 70 years ago by a Polish immigrant named Jimmy. Since then the company has grown into the longest operating hot dog stand on Maxwell Street. The Polish sausage sandwich here is simple and delicious. The Polish sausage is made with crispy cut of meat layered in Spanish onions, mustard, and spicy peppers. How can you go wrong?